Expectant hope. Abiding peace. Comfort of the soul. I think that pretty much sums up what most of us seek throughout our lives. That something to settle us and let us know all is right with us. Something that anchors us when everything else around us swirls out of control. Expectant hope is the overarching theme of Advent, the four weeks before Christmas. Last week was the first week of Advent and the theme was hope. We looked at longing of the soul as part of our human condition. This week’s theme is peace. I like to think of peace as comfort of the soul. It’s like a deep, satisfying sigh that signifies all is well. Unfortunately, and often during the holiday season, we lose touch with ourselves. We feel disconnected from our innermost being and don’t feel at peace by any sense of the word. We might even wonder if God is present at all. Or maybe we know God is present, but we’re tired of waiting and wondering if we have what it takes to hang on. The prophet Isaiah heard the same things from the people of Judah who were in captivity in Babylon. One question loomed large for the exiles. Since they had clearly failed to be God’s people, did they have a future? Would God again work in their midst, or would God simply abandon them? Could God act? In this crisis of faith, God speaks to the community through the messages of Isaiah. 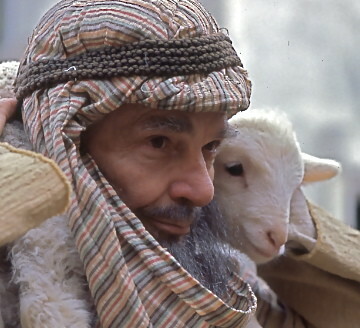 and gently lead the mother sheep (Isaiah 40:1-11). This passage from Isaiah is probably most familiar to us because of Handel’s oratorio, Messiah. For many, Messiah is the most well-known of all choral works in Western music. It might also be some people’s only knowledge of the Bible! Charles Jennens, who put the words together for Messiah, lifted large sections from the King James Bible (after all this was 1742) and the Book of Common Prayer. The word pictures Isaiah creates is an intimate portrayal of a God who cares deeply and who is intimately involved in our lives. At Advent, we wait for the kind of comfort only God can bring. Advent reminds us that we are only at the beginning of God’s great work in our lives. The sense is that there is much yet to be told, experienced, endured, and accomplished in our lives. During Advent we listen for God’s whisper of peace … comfort for our soul. Second Sunday in Advent bonus: Comfort Ye My People from Handel’s Messiah.